How do you tackle the biggest problem facing arable farmers in the UK? With a big, multi-institute, multi-disciplinary project of course! And that is exactly what we have done. The Black-Grass Resistance Initiative (BGRI) has been a four-year collaborative project funded by the Biotechnology and Biological Sciences Research Council (BBSRC) and the Agriculture and Horticulture Development Board (AHDB), and has involved technicians, Post Docs and senior researchers from Newcastle, Sheffield, York and Edinburgh Universities, the Zoological Society of London, and Rothamsted Research, which is where I have been undertaking my contribution to this project. The aim has been to take a gene to landscape approach towards investigating the causes of herbicide resistance in black-grass (Alopecurus myosuroides). As the initiative comes towards an end, what better time to look back at what we have achieved. My personal role has been as a technician on the project, working at Rothamsted Research and focussing on testing the herbicide resistance status of various black-grass populations. We started in the summer of 2014 by visiting winter wheat fields in the main areas of the country affected by the problem, from Oxfordshire across to Norfolk, Bedfordshire to Yorkshire, and collected seed from these fields. We then spent the next year testing all of these populations with three different herbicides to get a picture of the level of resistance within the UK. Our results have shown that 79% of our populations were resistant to all three of the herbicides we tested. 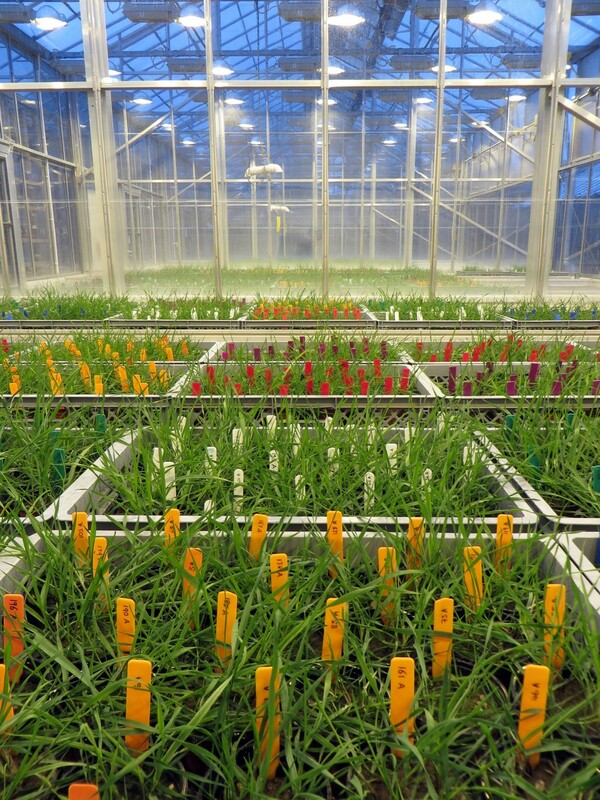 This preliminary work was vital for then focussing our subsequent glasshouse experiments on researching the genes underpinning resistance in black-grass. Whilst we have been focussing on the experimental side of the project, the team at Sheffield University have spent the past few summers visiting the fields to map the density of black-grass. This involves walking the tramlines and recording the density on a 5 point scale; absent, low, medium, high and very high. These results are then turned into distribution maps showing the patches of black-grass across fields and providing a means to compare densities across years. We ensure that these maps are sent to the farmers and we know that some of them use these to inform their black-grass management. Although the project is coming towards an end, we now actually have funding through a new Smart Crop Protection programme at Rothamsted to continue the mapping for at least two more years. A novel aspect to the BGRI has been that for all the fields surveyed by Sheffield and Rothamsted, we have collected historical management data going back as far as ten years and including cultivations, crop rotation, and herbicide applications. We have then used this information to develop models to determine if certain management strategies are leading to an increase or decrease in the black-grass problem. This data is also being used by our colleagues at the Zoological Society of London, who are focussing on producing models that will estimate the economic and environmental costs of black-grass to the agricultural industry. An important aspect of all projects is ensuring that the research is translated into application. One such example has been a diagnostic kit developed by Newcastle University, which tests black-grass plants for non-target-site herbicide resistance and was officially launched for commercial sale at the Cereals agricultural show near Duxford, a couple of weeks ago. This lateral flow device, works in a similar way to a pregnancy test kit, with a diagnostic band indicating a positive result (herbicide resistance) that can provide a farmer or agronomist with information for the coming growing season. This test is faster than current methods which involve collecting seed for testing which provides a retrospective answer. This kit will hopefully become another tool in the box for successful black-grass management. Vital to any initiative is communicating the research with the end-users, the people who really need to know the information, which in this case are farmers and agronomists. I believe we have been very successful at doing this. We have set up a website (http://bgri.info/) and a twitter account (@BlackGrassRI) which we use to disseminate our information such as research papers and newsletters. Our scientists have represented the BGRI at scientific and agronomy conferences as well as speaking at farmer meetings. We have had a presence at Cereals for the past few years and organised stakeholder meetings and workshops to present ideas and stimulate discussion. There have also been Farmer Focus Meetings with a targeted group of our farmers from different areas of the country that meet annually to discuss the project. All of these aspects of science communication and knowledge exchange have been so important in keeping farmers informed about what we are doing. "I have been working as a weed ecologist at Rothamsted Research, an agricultural institute in Hertfordshire, UK for 4 years. I am also the programme co-ordinator for the Smart Crop Protection project at Rothamsted. This requires supporting the scientists on the project, organising meetings and managing the science communication side of the programme. I fell into the science technician role after getting a job at Sheffield University 7 years ago and then successfully getting my current job working on black-grass at Rothamsted. I love being a technician, particularly because the work is always so varied. When I’m not getting my hands mucky in the glasshouses, I am Brown Owl at a Brownie unit or tap dancing. My greatest achievements have been gaining my Queen’s Guide Award, the highest award in Girl Guiding and taking part in a Soapbox Science event in 2016 which involved standing on a soapbox in a shopping centre for an hour talking to passing shoppers about black-grass." I am a farmer but originally in Australia and now in Italy. I would like to ask a few questions about the program. Seed has been collected from various sites but has the population of seeds in the soil been studied and the rate or dormancy/germination? When does the black grass shed its seeds? Are there seeds in the heads at the time of cereal harvest? If this is the case they can be separate and destroyed as in Australia. Historical data is being collected but only for ten years. I have heard anecdotally that burning the stubble reduced black grass but this has been prohibited for I think more than 20 years. Perhaps there are new ways to tackle the seeds without burning such as the new microwave weed control. Thank you for your comments. Seed dormancy is forecast each year by ADAS and previous work at Rothamsted has shown that black-grass seed declines in the soil by 70% after one year so this is why advice of ploughing down seed in a bad field can be used as a cultural control method. Research into seed in the soil bank hasn't been done by us recently and is an area we would like to explore in the future. Black-grass sheds it's seeds during late June/early July so unfortunately there are few seeds left on the head when the crop is harvested and therefore makes harvest weed seed destruction difficult. However, it is still technology that we are discussing as shown in this press release just the other day https://www.frontierag.co.uk/news-events/news/news-archive/1278-five-uk-farmers-using-chaff-deck which includes my line manager, Paul Neve, who knows the situation in Australia well having worked out there for a number of years previously. Yes, anecdotally stubble burning was an aid in black-grass control but this stopped in the 1990's and unlikely to be brought back. However there are various ideas that are being explored by other researchers/institutes such as the microwave technology that you mention, 'hoovering' seed from the soil after harvest and applying 'smoky water' which builds on the idea of stubble burning. The BGRI project has collected agronomic data from the past 10+ years, which is a unique aspect in this area of research, and we will continue to do so under current different funding we have at Rothamsted. One of our next tasks is analyse this data to see whether there are any patterns between what farmers are doing and how this controls black-grass. I hope this answers your questions and please don't hesitate to contact me at Rothamsted Research if you'd like any further information.